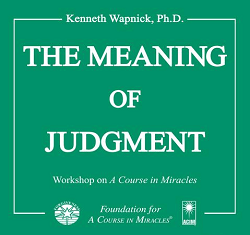 The topic of judgment is at the heart of Jesus' teachings in A Course in Miracles, and so it should be at the heart of our practice of the Course. As Jesus points out early in the text, the choice to judge is the cause of our loss of peace, and therefore when we meet ourselves and everyone else without judgment we will experience a release and a sense of peace so deep that it will be beyond anything we could possibly imagine (T-3.VI.2:1; 3:1). This series of excerpts is from an afternoon workshop presented in June 1992 at our Center in Roscoe, New York. It is based on "The Forgiving Dream" in Chapter 29 of the text, and centers on the four forms of judgment: (1) the dream of judgment against ourselves; (2) looking with Jesus at this ongoing judgment of guilt without further judgment; (3) judging all things in accord with the Holy Spirit's judgment; and (4) joining with Jesus in the judgment that God's Love is the only reality.